What’s this? A remake / sequel to one of the greatest John Carpenter films of all time? Can it be true? 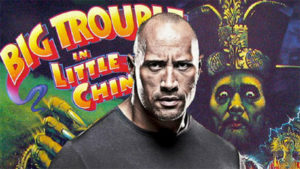 In June of 2015, articles were swirling around the Internet about a possible Big Trouble in Little China remake, starring Dwayne “The Rock” Johnson, fresh off his success in his “San Andreas” film. BTLC fans seemed to be mixed in their opinion of this news. Some were thrilled to be seeing Big Trouble revitalized on the big screen after almost 30 years, while others questioned not doing a true sequel starring Kurt Russell and company. Thanks to BTLC fans Mike, Josh, James, Nirias, and Nauta for the news! Looks like the website “The Nerdist” got Kurt Russell to briefly comment on the upcoming BTLC remake, starring Dwayne “The Rock” Johnson. Thanks to BTLC fan Stan for the head’s up! Update as of February of 2018: During my podcast interview with Jeff Imada (The Lords of Death member “Needles” in BTILC) for 5minutesoftrouble.com, Jeff mentioned that the Big Trouble Rock remake is still in development, pending a finished script. Supposedly the people involved in the project are hoping to get John Carpenter involved somehow as well. Back in June of 2017, BOOM! Studios released a new comic series called “Old Man Jack!” Learn more here. BOOM! 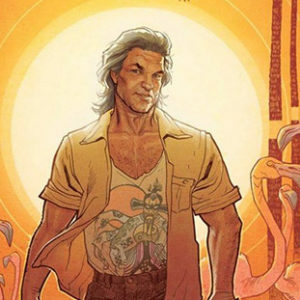 Studios released an officially-licensed comic series “Big Trouble in Little China” by John Carpenter, Eric Powell, and Brian Churilla. Learn more here. 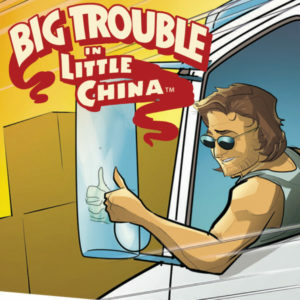 Not much has happened since then regarding a film sequel, but there have been various unofficial comic book releases picking up where Big Trouble in Little China left off. 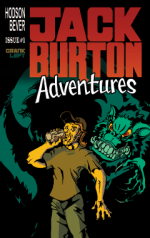 Check out the Jack Burton Adventures by Crank Left Comics for more info! Back in the late 1990s, I discovered that plans were once in the works to create a TV series based on Big Trouble in Little China, entitled “More Trouble in Little China.” A screenplay was created, but the project failed. AOLiveMC11: From RAven0875: Question: John, now that you and Kurt have resurrected Snake, is there any chance of Jack Burton and The Pork Chop Express making another run through Chinatown? With that in mind, back in 1998 I called on all John Carpenter and Big Trouble fans to unite and petition for Mr. Carpenter to make a sequel! 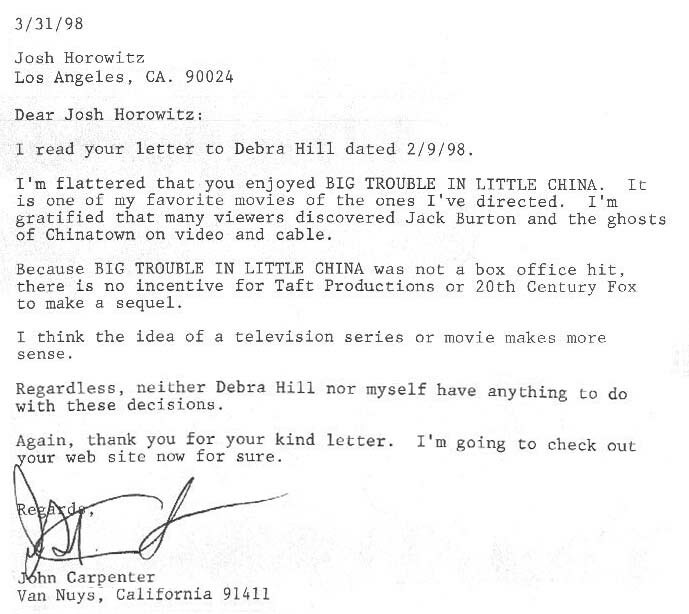 John Carpenter eventually responded to this petition campaign, flattered that there was still a large interest in Big Trouble in Little China. He noted that due to BTLC’s low box office returns in 1986, there is little incentive for Taft Productions or 20th Century Fox to make a sequel. He did add, however, that the idea for a television movie or series might make more sense in the future, but neither he nor his production associate Debra Hill are involved in these decisions. Update: I had an opportunity to meet John Carpenter in person back in September, 1998. He attended a signing session to promote the re-release of his movie “The Thing” on DVD at Dave’s Video in Sherman Oaks, CA. After waiting in line for two hours and having to buy a copy of the film on DVD (I still don’t own a player) I finally faced Mister C. himself. I had very little time, but I quickly introduced myself as the guy who contacted him through Debra Hill’s office regarding making a BTLC sequel. He said something like “Oh yeah,” but I doubt he remembered after signing copies for the last few hours. Somewhat discouraged, I pulled out my Big Trouble film poster for him to sign and complemented him on making a great film. He brightened at seeing Jack Burton’s smiling mug and happily signed his name near the bottom. As he was doing so I raised the sequel issue to him again, quickly explaining how there was a significant fan base out there who check out the web page and enjoy the film on video. These people really want a sequel. Expecting this, I countered by saying that if money wasn’t an issue, if he could go ahead and make a sequel, would he do it? I could have pressed JC further but the video store people were gesturing for me to leave. I shook Carpenter’s hand and left, thanking him for his time. If you could film a sequel to any of your movies, which one would it be? It might be nice to do one for The Thing or They Live – I don’t know. It would be fun to do another Jack Burton adventure, but Big Trouble in Little China didn’t make any money – it was a bomb! So that one would be hard to justify a sequel for.